Flower Island i Montevideo, Uruguay: Reservér nu! 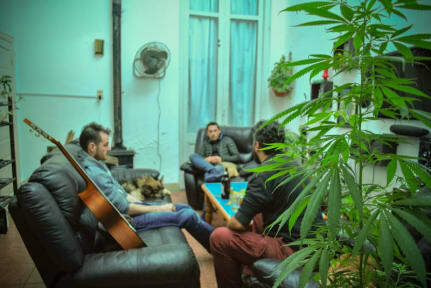 A chill out environment, where we encourage good vibes among all. Flower Island has a spacious 100% equipped kitchen, living room with, cable TV, PS4, Netflix and surround sound. The WiFi is free and covers throughout the property. Carries a rooftop with a grill where we often make barbecues and other typical foods. The house has a laundry, 2 shared bathrooms and bicycles for renting. If you want to relax and know the real Montevideo, Flower Island is your best option. Flower Island is a guest house with spirit for the young! 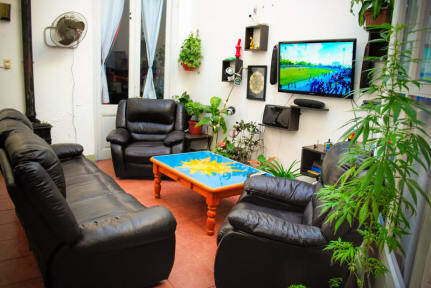 Located in the epicentre of Afro-Uruguayan culture, just a few blocks from Av. 18 de Julio, the main avenue of the city. A place where you will find the balance between the warmth of a home and the possibility of meeting people from all around the world. Also count with a Growth Shop where you can find everything you need in order to grow and smoke. In this neighbourhood, a large part of Montevideo's and Uruguay's culture is born. Accordingly, every weekend there is an Afro-Uruguayan drum show. Less than 30 minutes walking from the most important tourist spots of Montevideo. Furthermore within 300 meters you have bus stations with connections to the entire city. We have the perfect accommodation. It has 2 private rooms, one for up to 4 people with a king size bed and bunk beds and another for up to 3 people, with a double bed and a single bed. As well as a shared room for 5 people.